Kids who are healthy make happier and better students—and they miss less school. No one knows this better than school leaders. This is an exciting time because California now has new free and low-cost health insurance options for children and adults. Now, nearly every family can find an affordable health insurance plan. CSBA is partnering with The Children’s Partnership “All In” campaign to help schools get information out to families and employees about the new affordable health coverage opportunities. Covered California, California’s new health insurance marketplace, opened on Oct. 1 and offers ways for millions of Californians to obtain health coverage, including health and dental coverage for children. In addition, hundreds of thousands of uninsured children are currently eligible for Medi-Cal and just need to apply. These programs cover well-child check-ups, sick visits, immunizations, hospital stays, vision care, prescriptions, and dental care for children, as well as mental health services and other health care services for both children and adults. Open enrollment runs through March 31, 2014. Schools and school leaders can play an important role helping families, children and employees get information – and get covered. 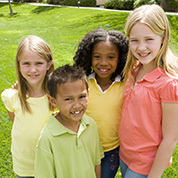 The Children’s Partnership website has a toolkit you can use to promote enrollment. School athletic events are a great place to start. For more information about the federal Affordable Care Act, see CSBA’s January 2013 governance brief “Health Policy: Implications of Covered California for School Boards, Districts and Personnel.” It offers a useful overview of how the federal health care law affects California school districts and county offices of education as employers. When our children have health insurance, they are more likely to get shots to prevent disease, get treatment for chronic problems like ear infections and asthma, stay out of the emergency room, and miss fewer days of school. And healthier children also mean a healthier workplace at school.